27 Models. 3 Days. 90 ft sq workspace on location. 20"x30" prints required. I had been getting my hair cut at this place since highschool and after 6 years and countless business cards I finally landed the job. I'll admit that I was a little nervous but I new I had the technical skills and (most of) the equipment necessary to accomplish it. 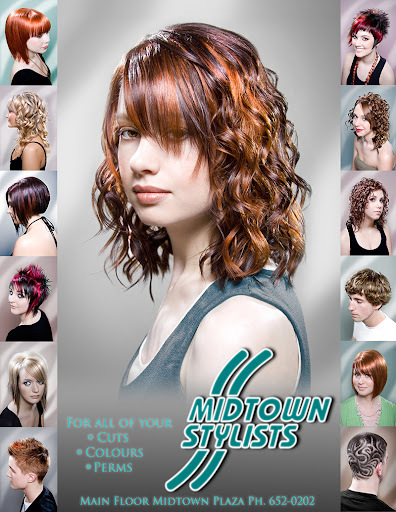 What are the major considerations for showcasing hair and hairstyles? Considerations for this shoot in particular? Long days full of shooting, will batteries hold up (both cameras and flashes)? Do I need more memory cards? Can the 40D handle 20x30 enlargements of portraits? I am a worry wart by nature, because of this I often over plan things. In this case it proved to make things much much easier. The worry over batteries: I have 3 for my 40D which should suffice. Rechargeable AA's for the flashes? I don't know since I've never shot for 8hrs straight before, to be safe I picked up an extra 4 sets of 4 and 2 chargers (bringing my total to 8 sets). Memory cards: I should be good with two 4GB, a 2GB, and two 1GB cards plus my laptop to dump them if I need to. My Canon 40D handling enlargements: At first I wasn't sure, I had done landscapes that size but portraits seem to need to retain more sharpness. I decide to do a test print from a recent shoot and am content with the results, its on the upper limits of this camera but doable. Prior to the test print I was thinking about using my Yashica 635 medium format TLR, luckily I didn't have to (the film costs would have added up). Over the last year I've been following the Strobist blog which really helped take some of the edge off regarding the lighting since I've learned quite a bit. Also as a result of that blog I have a pretty portable setup to draw on should I need it. I realized that since I would be shooting on location I would need a suitable backdrop, initially I thought since the photos will be primarily head and shoulders I wouldn't need much for a backdrop. I figured that I'd just bring a white sheet and do the rest in post. Further thinking raised two questions: how professional is this going to look if I show up with a bedsheet backdrop and since I'm shooting at small apertures aren't all the wrinkles going to be in focus too? I could nuke it but I don't want risk to burn away the edges of the hair. OK so no bedsheet, I need a better solution. $215 later I'm a proud owner of a Cameron portable backdrop kit, with a 3 section crossbar it can accommodate a full 9ft roll or by taking a section out a half roll of seamless background paper. In addition I was pleasantly surprised to find that the two side poles were essentially lightstands, that was a bonus because I'd been wanting to pick up more. I've since found cheaper versions (i.e. less expensive, not quality) of this backdrop kit online at B&H and other places, I needed mine quick so I didn't have a choice. Now I've got the gear that I need to shoot this, I can start thinking more about the lighting configuration I will need. I've got two 400W studio strobes if I need them, however they are entry level ones and do not allow much control (full, 1/2, 1/4 that's it). I've also accumulated a number of flashes (damn strobist addiction) so I have a Canon 580EXII, 430EXII, 540EZ, and two Nikon SB-26's. For triggering I have 4 sets of YongNuo PT04TM "poverty wizards" and if I need to use it both of the Nikons have built in optical slaves. Having not worked with the battery powered speedlights too much I really have no idea how fast the batteries drain. Because of this I start thinking it might be wise to bring in at least one of my studio strobes. I decide to do a test shoot using one 400W strobe in a softbox directly above the camera and then a speedlight with a gridspot on it to kick up the hair. This allows nice soft lighting yet still allowing shadows to keep it interesting and three dimensional. A close friend of mine, and frequent guinea pig of mine, was nice enough to come over for a quick test shoot. Within a few attempts I managed to get the lighting roughly how I wanted it, there was nice a nice sheen to the hair and with the seamless background I could remove frizz if necessary. At this point I can breath a little easier, I know my lighting setup now and should be ready to go. A week later it was time for the main event, I was asked to come setup a day in advance. As it turned out due to a stylist going away on holidays the next day I was asked to shoot one model as well. This worked out to be a good test shoot to make sure everything was working, also since there was only one person there wasn't a rush. The shots turned out decent, I had highlights in the hair and the face was pleasantly lit. My stress level dropped significantly at this point. That night as I was laying in bed I started to stress again for no reason. I figured I should put another speedlight on the other side to balance it out, if I found my batteries were depleting quickly I could get rid of it. We had slated 30min per model which at first I thought was going to be pushing it, as it turned out each sitting only took 10-15min and I was getting 50-70 shots of each model. My fears regarding battery life turned out to be unwarranted. I could shoot most of the day at 1/8 power before my recycle time started to become an issue, at which point I simply tossed them in the charger and plugged in a new set. I only really needed the 4 sets I already had. Better safe than sorry. I should also point out that I had zero misfires with the cheap $20 per set wireless triggers I was using. Twice in three days I had them fire when I wasn't shooting but I'll take that over a missed trigger anyday, I highly recommend them. If you click the link it will take you to dealextreme, I should point out though I ordered my last 2 sets off ebay because dealextreme ran out. I was pleasantly suprised to find the ebay ones had pc sockets on the recievers which my earlier onese did not, these however were $30/set but worth it for the sockets. Minor adjustments in lightroom to correct the exposure and bring up any lost detail in the hair. The real work began in photoshop, aside from the standard "airbrushing" of blemishes etc the most challenging aspect was frizz removal. No matter how careful the hairstylist is there will always be some frizz, for these shots though I wanted them to look perfect. In the end I found going in by hand with the heal brush set to replace worked the best, it was tedious but it yielded great results. For the background I just made some arcs in white, blurred them out, then masked around the model. I actually made a variety of backgrounds but in the end the client decided to go with the "swoosh" for all of the shots. I was left to choose what background colour I thought would match the best. I tried to keep it subtle so as not to overpower the model, sticking to complimentary and analogous hues using the colour wheel. Well done James! I'm still working on the all or nothing balancing act of feathering and complimenting my subject with additional light. I entirely understand your stress... even Bert & Pieter from LIME, in their second last podcast, expressed that there uncertainties nag at them before shoots. That was a good gig, a job well done and a feather in your cap. You've handled the worst. Anything now should be a cakewalk. Thanks for the comment Jay. I think no matter what there will always be some anxiety before a shoot, if there isn't then it means you're not pushing yourself. Very true! Safe is just that. It won't stretch you to new heights, as incremental, or significant, as they may be. Our hairstyle defines our look, to a large extent. We can beautifully disguise ourselves behind a look, if it goes right. Depending on the Hair Cut you can probably look younger, stylish & glamorous with just a bit of tweaking here and there. This is a Flickr badge showing items in a set called Best of JPH Photography. Make your own badge here. I have prints and T-Shirts available at my Redbubble store, click below to see. I'm a very creative person, if I'm not knee deep in some type of project then there's something wrong. My interests vary widely and so does my knowledge. Most of the stuff I do is all self taught, I just dive headlong into something and learn as I go.